Ouch! That smarts! Treat your minor cuts, scrapes and scratches with the incredible healing power of a designer bandage. And if a fancy bandage isn’t enough to dry up your tears, how about a FREE TOY! Each 3-3/4" (9.5 cm) tall metal pocket tin contains twenty-five 3" x 3/4" (7.6 cm x 1.9 cm) adhesive bandages and a small plastic trinket to help make even the ouchiest owies feel all better in no time. These are now rare as they are very hard to find and are no longer produced. 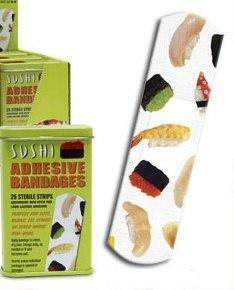 If you've ever wondered what an autopsied human looks like these sushi bandages might give you a good idea.